The Music of Chopin By: Mr. Emerlindo C. Matienzo Marikina High School. 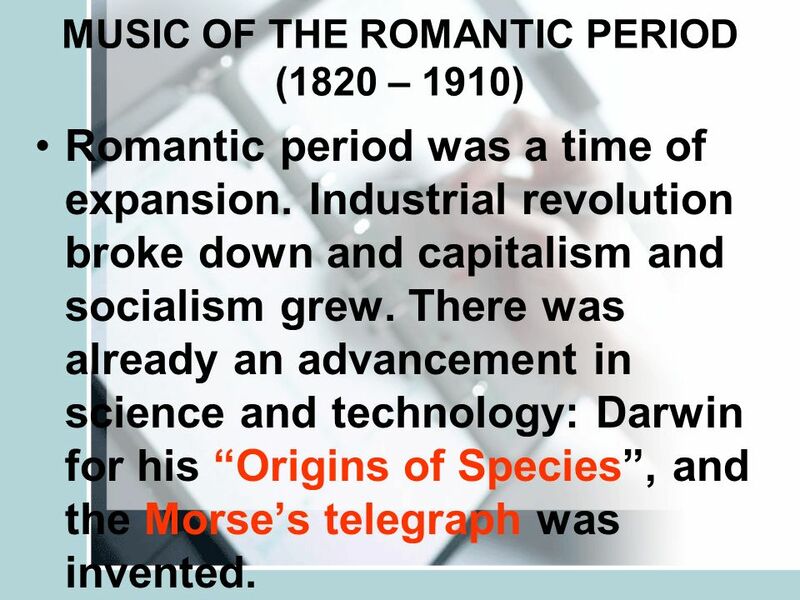 3 MUSIC OF THE ROMANTIC PERIOD (1820 – 1910) Romantic period was a time of expansion. Industrial revolution broke down and capitalism and socialism grew. There was already an advancement in science and technology: Darwin for his Origins of Species, and the Morses telegraph was invented. 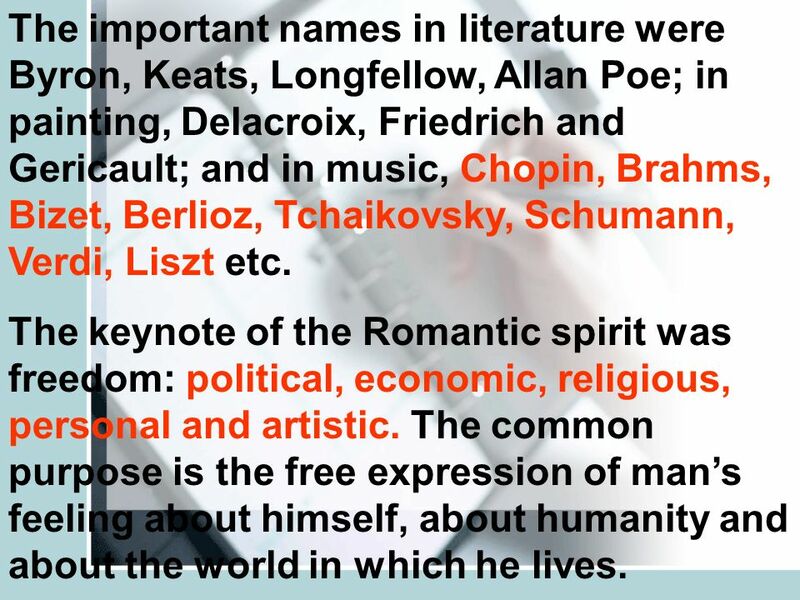 4 The important names in literature were Byron, Keats, Longfellow, Allan Poe; in painting, Delacroix, Friedrich and Gericault; and in music, Chopin, Brahms, Bizet, Berlioz, Tchaikovsky, Schumann, Verdi, Liszt etc. The keynote of the Romantic spirit was freedom: political, economic, religious, personal and artistic. The common purpose is the free expression of mans feeling about himself, about humanity and about the world in which he lives. 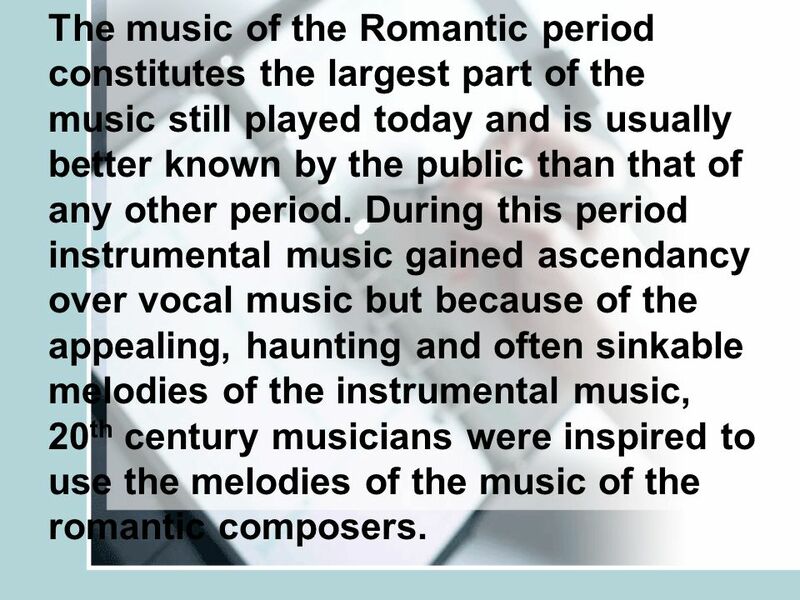 5 The music of the Romantic period constitutes the largest part of the music still played today and is usually better known by the public than that of any other period. During this period instrumental music gained ascendancy over vocal music but because of the appealing, haunting and often sinkable melodies of the instrumental music, 20 th century musicians were inspired to use the melodies of the music of the romantic composers. 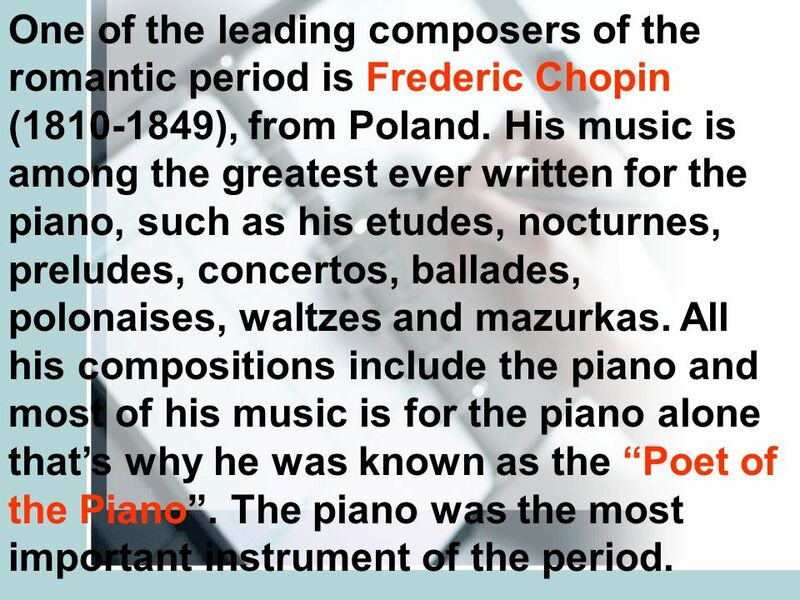 6 One of the leading composers of the romantic period is Frederic Chopin (1810-1849), from Poland. His music is among the greatest ever written for the piano, such as his etudes, nocturnes, preludes, concertos, ballades, polonaises, waltzes and mazurkas. All his compositions include the piano and most of his music is for the piano alone thats why he was known as the Poet of the Piano. The piano was the most important instrument of the period. 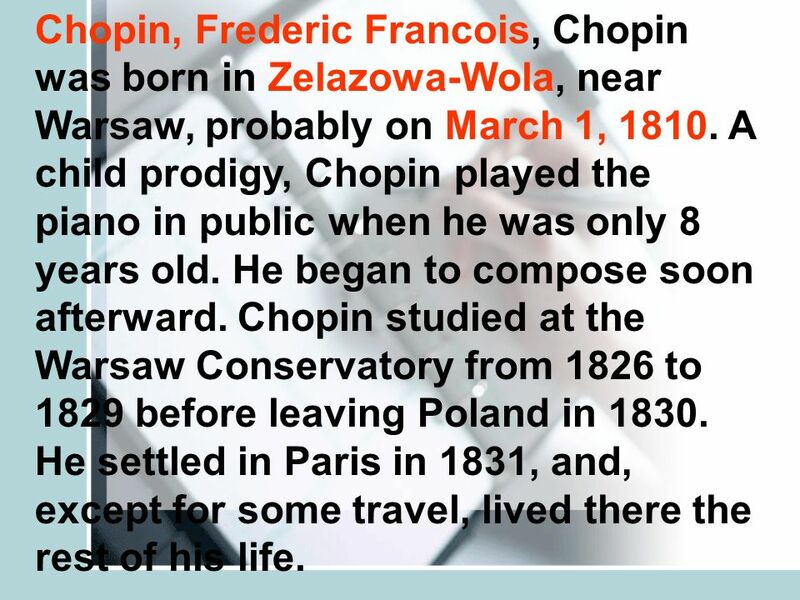 8 Chopin, Frederic Francois, Chopin was born in Zelazowa-Wola, near Warsaw, probably on March 1, 1810. 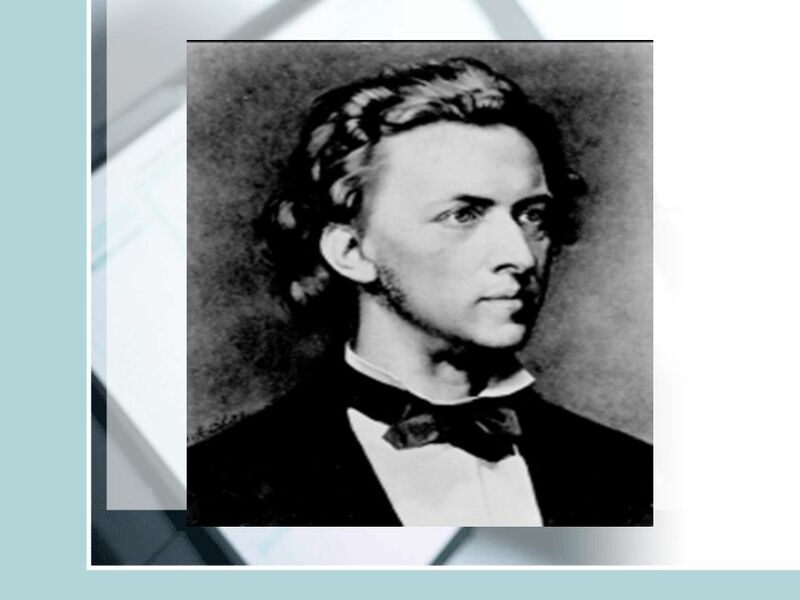 A child prodigy, Chopin played the piano in public when he was only 8 years old. He began to compose soon afterward. Chopin studied at the Warsaw Conservatory from 1826 to 1829 before leaving Poland in 1830. He settled in Paris in 1831, and, except for some travel, lived there the rest of his life. 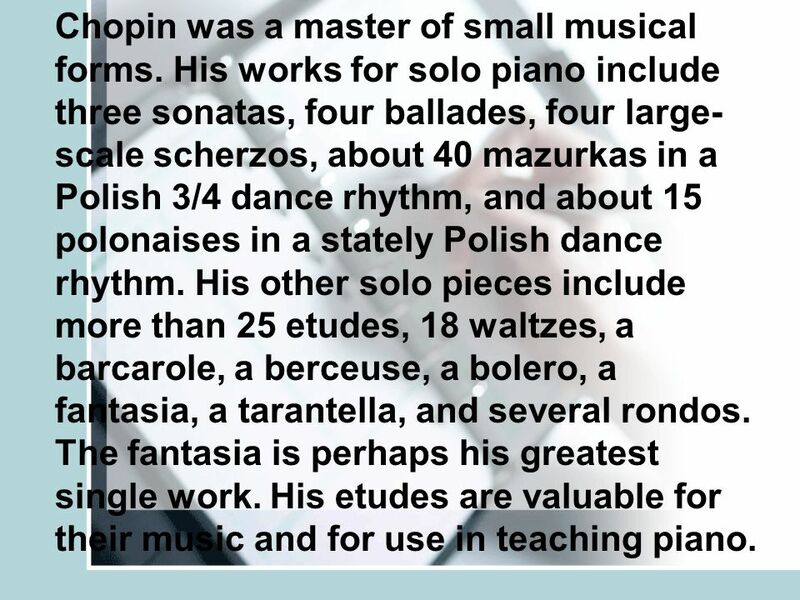 10 Chopin was a master of small musical forms. His works for solo piano include three sonatas, four ballades, four large- scale scherzos, about 40 mazurkas in a Polish 3/4 dance rhythm, and about 15 polonaises in a stately Polish dance rhythm. His other solo pieces include more than 25 etudes, 18 waltzes, a barcarole, a berceuse, a bolero, a fantasia, a tarantella, and several rondos. The fantasia is perhaps his greatest single work. His etudes are valuable for their music and for use in teaching piano. 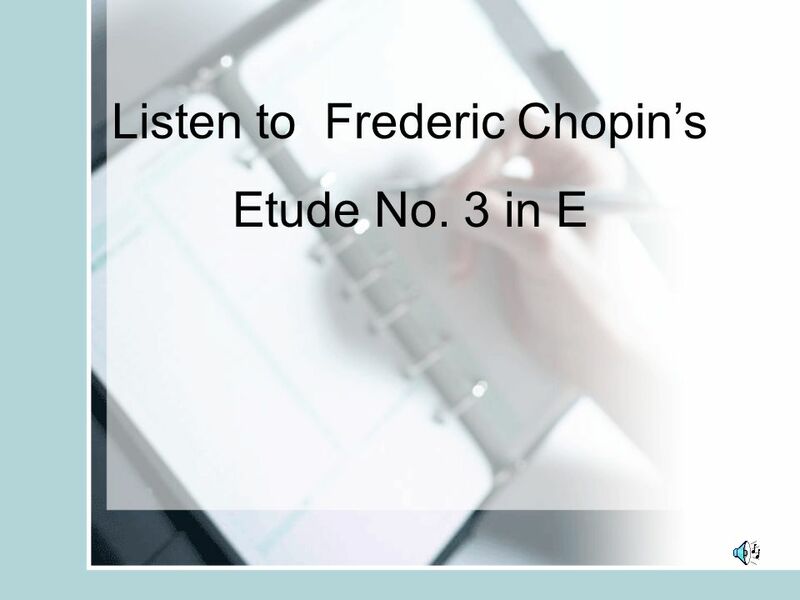 11 Etude No 3 in E is another work of Chopin which was known to many as No Other Love. An Etude is a study. Its a piece that develops technical skill and sometimes composed for public performance. 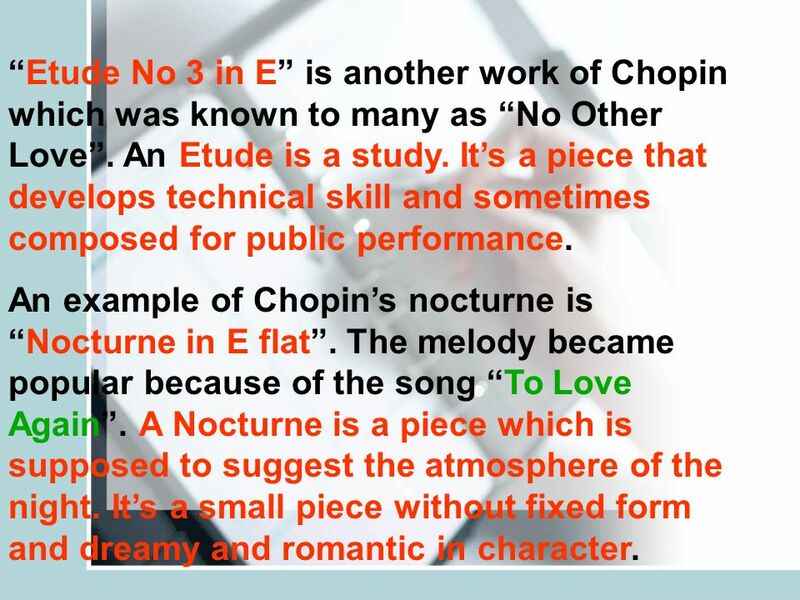 An example of Chopins nocturne isNocturne in E flat. The melody became popular because of the song To Love Again. A Nocturne is a piece which is supposed to suggest the atmosphere of the night. Its a small piece without fixed form and dreamy and romantic in character. 12 Polonaise, waltz, and mazurka are all dance forms in triple meter but with different rhythmic patterns. 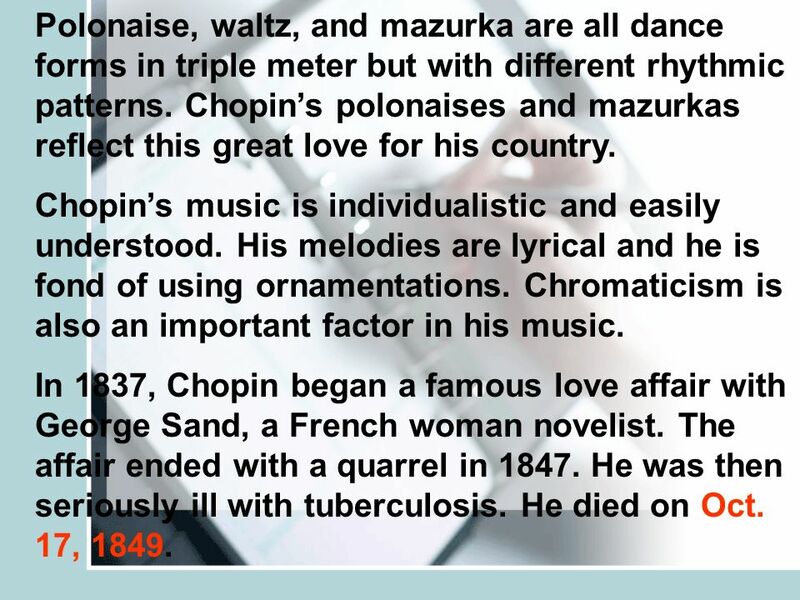 Chopins polonaises and mazurkas reflect this great love for his country. Chopins music is individualistic and easily understood. His melodies are lyrical and he is fond of using ornamentations. Chromaticism is also an important factor in his music. In 1837, Chopin began a famous love affair with George Sand, a French woman novelist. The affair ended with a quarrel in 1847. He was then seriously ill with tuberculosis. He died on Oct. 17, 1849. 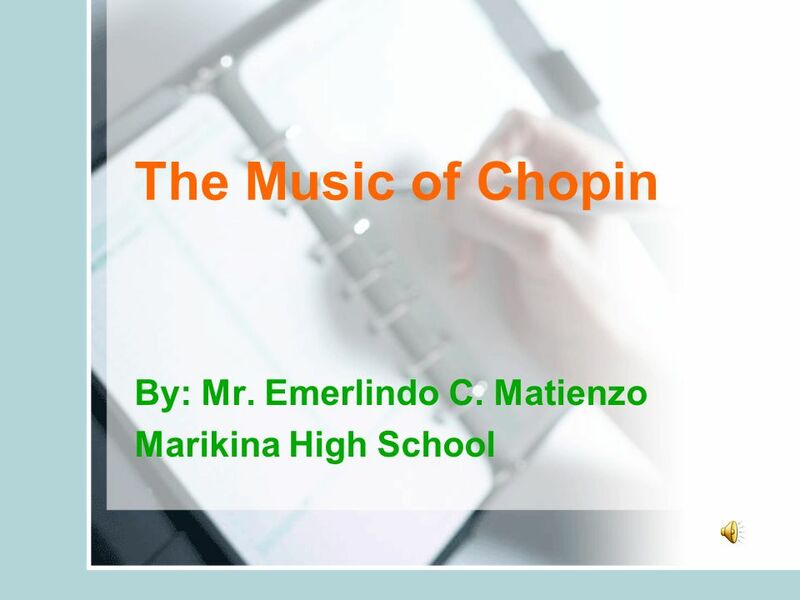 Download ppt "The Music of Chopin By: Mr. Emerlindo C. Matienzo Marikina High School." GRIEG & NATIONALISM in MUSIC BY: Mr. Emerlindo C. Matienzo. The birth of a genius. Chopin and the Piano Music of the Romantic. 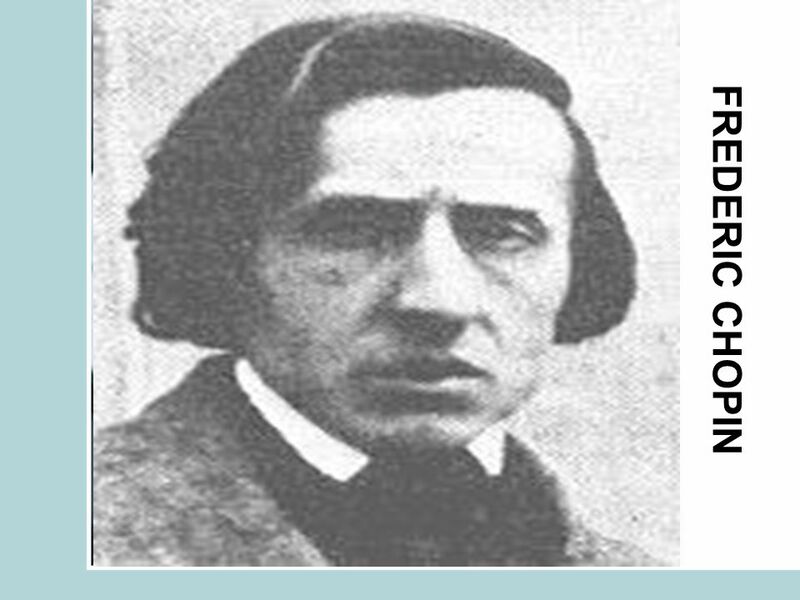 Frédéric François Chopin ( ) His Life Has been called the poet of the piano and his art constitutes. 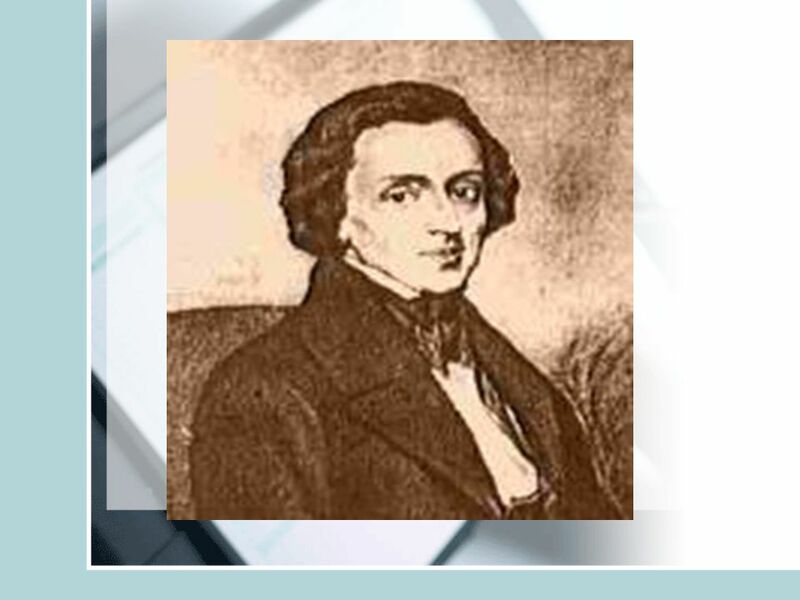 Frédéric François Chopin  Born: 1 March 1810  Just outside Warsaw, Poland. Music History. The Romantic Era ( )  The term Romantic refers to the music being expressive and emotional (rather than referring specifically. FRÉDÉRIC CHOPIN. When and where was Fr é d é ric born? Frédéric Chopin was born on 1 March 1810 in Żelazowa Wola. Frédéric Chopin was born on 1 March. IB Music SL Romanticism Unit 17 Piano Literature. Jan Matejko / / is one of the representatives of the Polish historical painting. 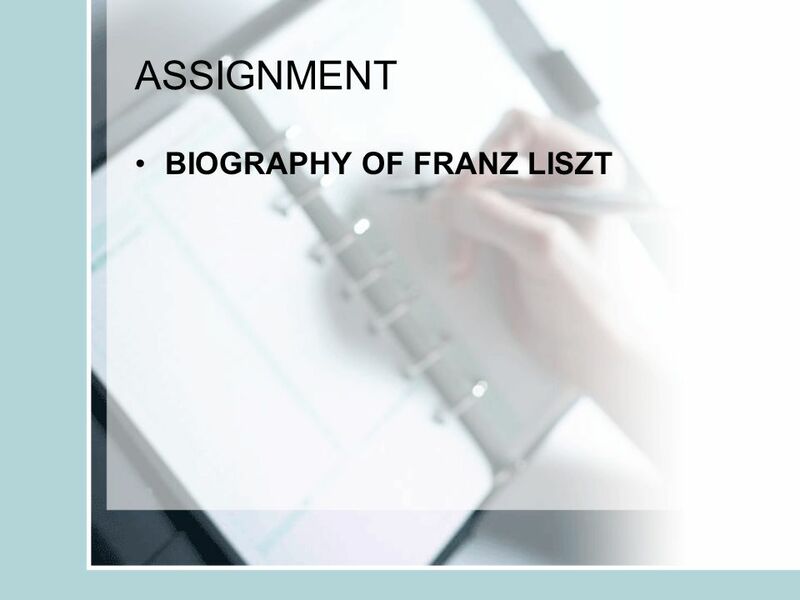 He studied in Kraków, then in Munich and Vienna. He was a member. Chapter 16: The Early Romantics The “Character Piece” for Piano. Chopin was born on March 1, 1810 in Zelazowa Wola, Poland. He died on October 17, 1848 in Paris. Announcement Activity 2 due March 20 Activity 2 due March 20 Exam II on 4/8 (after spring break) Exam II on 4/8 (after spring break) Review sheet will. The Romantic Era. Characteristics Emphasis on the search for free expression of personal feelings A revolt against convention and authority Formal perfection. The Romantic Era. The Romantic Period Approximately Growth of established forms; such as opera, mass, symphonies and concertos. Greater experimentation. A time of Imagination & Mystery. Emotion-filled Music Reaction against Classical Period A new sense of Political & Artistic Freedom Industrial Revolution.  Because of the revolutions happening in Europe and the Americas, patriotism was stronger than ever.  Composers started adding national traits in pieces.